"I don’t feel I should have to justify my existence." 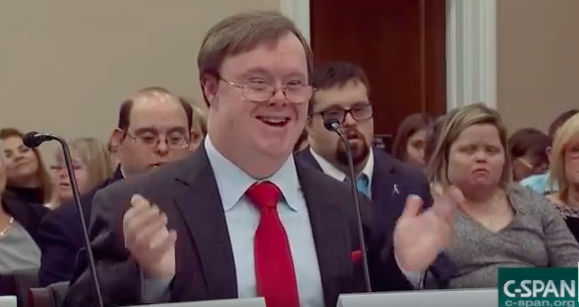 Last week, actor and Down syndrome advocate Frank Stephens powerfully testified before the House Subcommittee on Labor, Health and Human Services, and Education Committee on Appropriations about the value of life — specifically the value of the lives of those born with Down syndrome. “I am a man with Down syndrome, and my life is worth living,” he emphatically stated during a committee hearing on Wednesday. Stephens, who is a Quincy Jones Advocate at the Global Down Syndrome Foundation, went on to explain that he has lived a full and productive life, citing his acting roles, speaking gigs at major universities, contributor credit in a best-selling book, and two trips to the White House as just a few examples. With more and more countries seemingly turning toward a family planning method that picks and chooses “which humans get a chance at life,” Stephens pleaded with the congressional committee to increase funding for research into Down syndrome so that America can emerge as a beacon on the hill when it comes to defending and advocating for the sanctity of life.